We have received numerous calls and condolences for Djuna. My friend Nanci was watching Animal Planet the other night (it's summer, there is nothing on television!) and saw Cats 101. (Full disclosure, I, too, have watched Cats 101, which is a kind of video version of cat breed book. 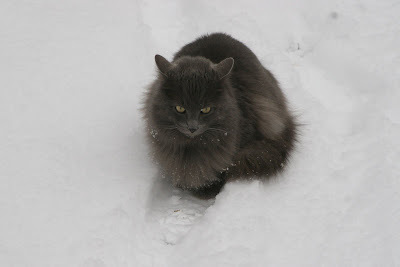 I, however, missed the Nebelung.) Nanci immediately thought of Teddy. Does he look like someone we know? Well, yes indeed. 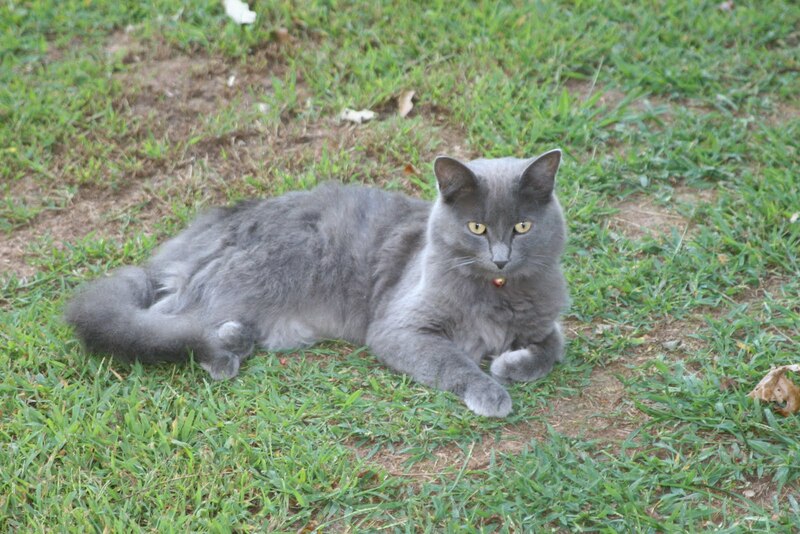 Our little chicken cat, Teddy, appears to have all the characteristics of a Nebelung. Teddy is now very upset to find that he has been neutered, as he is sure he would have produced award-winning offspring. Who knew. Here's the info: The Nebelung (NAY-bel-ung) breed began the way so many of our breeds began, stray cat wandered out of the mist and into someone"s home and heart. In the early 1980s a black domestic vagabond-turned-housecat named Terri produced a litter of three. Two short haired black females and one long haired male. The father, another anonymous nomad, was thought to have been an Angora mix. Terri's owner, Cora Cobb of Denver, Colorado, gave one of the female kittens, Elsa, to her son, and in 1984 this short haired black domestic produced a litter of kittens that included a blue semi-long haired male kitten. Subsequently named Siegfried, this kitten became the Nebelung's foundation cat. Elsa's next litter, fathered by the same short haired Russian Blue-type neighborhood Tom, produced a female kitten, Brunhilde, who possessed Siegfried's qualities and characteristics. By that time, Cobb was so taken with Siegfried,s beauty and personality that she decided to see if she could preserve his qualities by breeding brother to sister. In May 1986 Siegfried and Brunhilde proved to Cobb that they bred true by producing a litter of three blue long haired kittens. 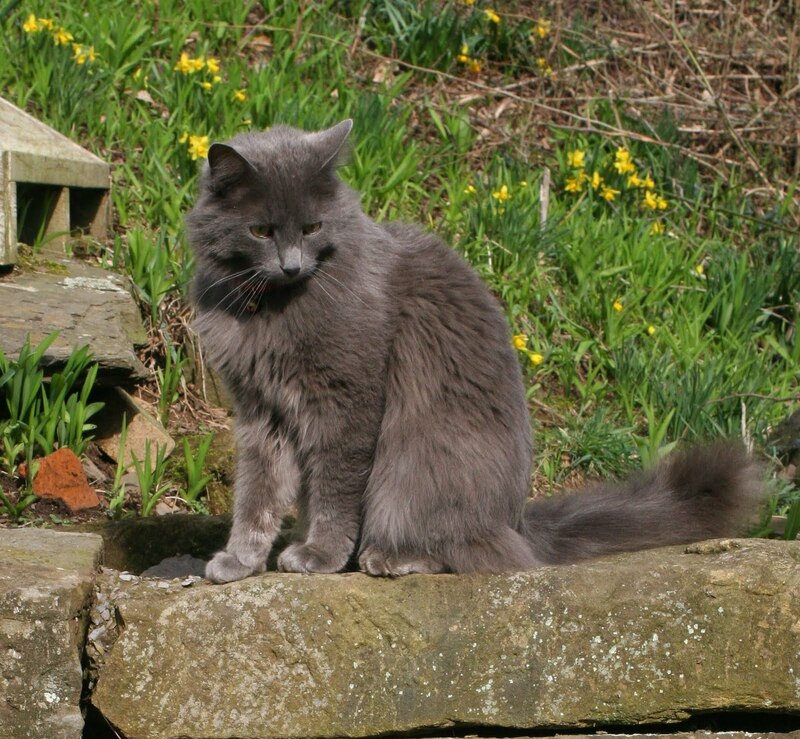 Cobb named the cat the Nebelung, a German word that means creatures of the mist. On the advice of TICA's genetics chairperson Dr. Solveig Pflueger, to whom Cobb turned for guidance in establishing her new breed, Cobb wrote the Nebelung's standard to match the Russian Blue's, almost word for word except for the coat length and the general opening description. TICA accepted the Nebelung for registration in September 1987. At first, the Russian Blue breeders were cautious about accepting Cobb's newcomers and Cobb had difficulty finding a breeder who would provide registered Russian Blue breeding stock. Finally, the owner of Supreme Grand Champion Vladimir of Castlecats agreed to offer her cat for stud with one of Brunhilde's daughters, who produced a litter in June 1988. Since then, the number of Nebelungs has slowly grown and, despite setbacks, the breed has caught worldwide attention. The Nebelung has appeared twice on the front cover of a Japanese cat magazine, and Nebelungs were shown and sold at the 1989 TICA cat show in Paris, France. Nebelungs are mild, soft-spoken, and gentle. They are generally reserved around strangers, ranging from hiding-under-the-bed timid to warily eyeing intruders from a safe distance. Given humans unpredictable behavior, this could be interpreted as a sign of extreme intelligence. To their family, Nebelungs are like Russian Blues, affectionate and playful although not intrusive. They tend to bond with a select few humans and stay loving and devoted throughout their lives. 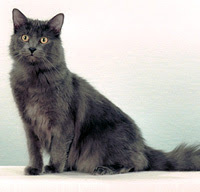 The primary difference in conformation between the Nebelung and the Russian Blue is coat length, otherwise, the standards are almost identical. Whereas the Russian Blue's coat is short and dense, the Nebelung's fur is medium-long, silky, and possesses a dense undercoat. The bright blue color is contrasted with silver-tipped guard hairs and therefore the coat catches the light, giving it a luminous, misty quality. Even with a dense undercoat that makes the coat stand away from the body, the fur resists matting and does well with a good once-a-week brushing. The Nebelung is a distinctly elegant cat with an angular, modified wedge-shaped head consisting of seven flat planes. Its most outstanding characteristic is its coat. Shape foreign; length long; boning fine; musculature lithe; slender. Note cat will appear chunkier due to density of coat. Modified wedge with flat planes; straight nose and flat forehead forming two planes; muzzle medium length, no break. Almost as wide at base as tall; appear pointed; slightly rounded tips; size rather large; set far apart, as much on side as top of head; furnishings sparse. Almost round, just oval enough to show Oriental slant; size rather large; set far part. Color green. Straight, tapering from a rather thick base to slender tip; size slender; length long. Medium-long on body with fluffy tail; texture fine, soft, silky. Even bright blue throughout with lighter color preferred; guard hairs are silver-tipped, giving the coat a lustrous appearance. Any white spots or lockets; full penalty for eyes with no green. While this is certainly more information than you could ever want to know, we were very interested. Teddy is quite thrilled to find that he was NOT named after a character in a Wagner opera, but he is willing to be photographed for Japanese magazines.